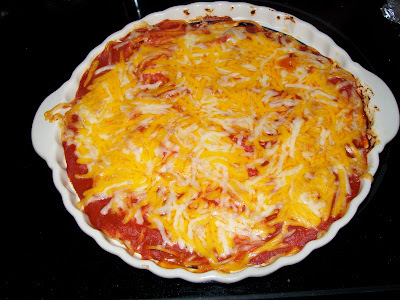 Frugal & Fabulous: Frugal Recipe - Spaghetti Pie! Frugal Recipe - Spaghetti Pie! "Combine drained spaghetti with egg and shredded cheese. Press into a greased 9-inch pie plate. Spoon spaghetti sauce over spaghetti crust. Cover with foil. Bake at 350 for 25-30 minutes. Remove foil and top with shredded mozzarella. Bake for an additional 3-5 minutes until cheese is melted. Slice and serve!" **I found this great recipe at Fun Foods on a Budget. It came out pretty good if I do say so myself. :) It's a nice alternative to leftover spaghetti!!! I'm going to try this one! Thanks! I always need easy/quick meals! Hey! There is only one flavor of the nature's seasons. When I've been able to find it, it's been at S&S. I totally owe you an email too. Haven't forgot, just have been feeling sick (still!). Thans for sharing! We actually had spahgetti for dinner tonight! Made this for lunch using your recipe!! i thought my husband was going to eat the entire thing!! it was so good!! im linking you in my post about it!